Randolph County is located in central North Carolina. It was named for Peyton Randolph, first president of the Continental Congress. The county seat and largest city is Asheboro. As of 2010, the population was 141,752. The state’s center of population is located a few miles east of Seagrove in Randolph County. The county was originally settled by Quakers. This religious group strongly opposed slavery and worked to undermine the dominance of the slave power in North Carolina. Methodists played a key role in the founding of Trinity College, later moved to Durham and renamed Duke University. Historically, manufacturing dominated the county’s economy; the loss of these jobs has been a major problem. Perhaps the county’s most famous attraction is the North Carolina Zoo, located in the Uwharrie Mountains and the largest walk-through zoo in the world. Politically, Randolph County is strongly Republican. 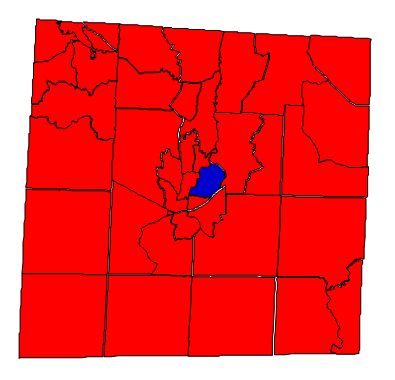 Mitt Romney carried Randolph by 50 points in 2012, netting more votes out of this county – over 30,000 – than any other in the state. Thus, Randolph can be considered the most valuable county for Republicans running statewide. With the exception of one precinct in eastern Asheboro, the county was red. Forecast: Historically Republican, Randolph County has not gone for a Democrat in a presidential election since Franklin D. Roosevelt in 1940. Republicans hold a huge lead in voter registration, control the County Commission, and the entire legislative delegation is Republican. In Congress, Randolph is divided between the 2nd and the 8th congressional districts, represented by Republicans Renee Ellmers and Richard Hudson, respectively. The growth rate in the 2000s was 8.66%, somewhat weak by North Carolina standards. Presently, the county is barely adding population. Democrats can improve by reaching out to the growing number of Hispanics, which now represents 10% of the population but a much smaller percentage of the electorate. In a good year for Democrats, Republicans can be held down to below 70% of the vote. White and mostly rural, Randolph’s demographics are quite favorable to the modern Republican Party and they should continue to do very, very well here for the foreseeable future.